I wanted to do a monochromatic card and decided on using only blue cardstock. I chose the Blessed Mouse stamp from My Favorite Things. I think it's a cute image, and I love the sentiments that come with it. My mouse is colored with copics---no sparkle or embellishments on this card, which is quite unusual for me. Did you know that My Favorite Things are having a Guest Designer contest? The winner gets to be the Guest Designer for August. Be sure to check out this post for all the details. Don't forget to take a look at all the entries, as they are usually awesome. Lastly, I inked the edges of all the cardstock with broken china distress ink from Tim Holtz. 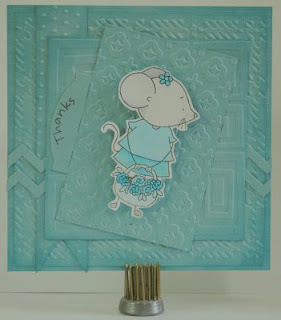 Then I embossed each piece of cardstock using a different cuttlebug folder, to add texture to the card. This card is so sweet, Janet! I love all the textures in the monochromatic background. Thanks so much for stopping by during the Paper Smooches August Release Hop!